Many beginning Minecraft players enjoy getting a pet or group of pets to help them explore the digital world. Dogs (tamed wolves) and cats (tamed ocelots) are the most common animal counterparts for a player to befriend. However, one must go into the wild and tame a wolf or an ocelot in order to truly domesticate these animals from wild creatures into loyal friends! Our guide will help you learn exactly how to tame both beasts and build an army of pets to help you conquer the empire. First, you will need to find a wolf in the wild. All versions of Minecraft (PC, PE, and Console) have wolves. They spawn and live exclusively in the Forest and Taiga (any type of Taiga) biome. Unless you want to switch to Creative mode, you will need to find two wolves to tame in order to grow your pack efficiently. To tame a wolf, you will need to feed it a bone. Collecting bones is relatively easy and can be done by defeating skeletons, fishing, or can also be found in chests. Approach the wolf and right click on the animal with the bone selected. After a couple of tries, the wolf will fully consume the bone and you will become its master. Once two wolves are tamed (they will change in appearance), they can be bred to create your army. It is much easier to breed wolves then to continue to find the limited number that naturally spawn in the game. To actually breed dogs in Minecraft, simply feed the wolves with any type of meat (not fish) including raw or cooked forms of beef, chicken, mutton, rabbit, porkchops, and even rotten flesh. Food poisoning does not apply to dogs, so raw chicken and rotten flesh are perfectly fine to use. Puppies will be hungry, so have plenty of food on hand before breeding. Console edition will limit your dog army to 16 dogs, but that should be plenty. Dogs will naturally follow their owners, so don’t worry about losing your dogs. When your dogs become hurt or hungry, you can heal them with meat. Fortunately, they are good at killing their own meat. To tame an ocelot in Minecraft, found exclusively in the Jungle biome, you will need to feed it multiple servings or raw fish (any type of fish will work). However, a player can only tame a cat if the following conditions are met: the ocelot is in “begging for food” mode (which means the cat will slowly approach you), the player doesn’t make sudden / quick movements as it approaches, and the ocelot is within 3 blocks of the player. When all of these are met and the ocelot is tamed through fish, the creature will change from a Jaguar type appearance to one of 3 common cat colors — a ginger tabby, tuxedo (from Notch’s own cat), or Siamese. Unlike their dog counterparts, cats do not heal from food, only from potions. To breed multiple cats, you must first have two tamed ocelots. Feed the cats an uncooked fish of any kind and they will enter “love” mode, as designated with hearts above their head. It’s important to note that at least one of the parent cats needs to be mobile, as two sitting cats are unable to breed. Why Build A Cat and Dog Army? In Minecraft, growing a pack of dogs and cats (or a cat / dog army) can have several advantages. Tamed wolves will attack any mob (except creepers) that either attack their owner or is attacked by their owner. This provides a player with a walking army that not only protects from hostile mobs, but will also attack other types of mobs (such as passive mobs) providing a player with a significant amount of loot. 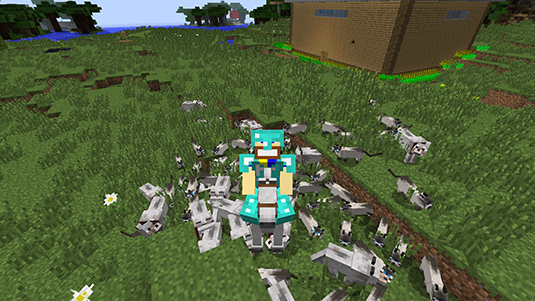 For those not in PE edition, adding cats to your pack of animals will provide additional benefits. Cats will repel creepers. By mixing dogs and cats together, you will be virtually immune to hostile mobs. Cats can also be left patrolling your house (or base) to prevent creeper invasions. Now that you know how to tame wolves and ocelots and breed them properly, you can become the Leader of the Pack, or the crazy cat person, and build your army of Minecraft pets.